A Bay City firm, Corcoran Laboratories, Inc., that also has a Traverse City facility, holds sole rights to the Dow Corning technology and is one of three firms in the world selling the chemicals used in the preservation process. TAMPA, FL -- Since the age of the Pharoahs, preservation of human bodies has been an obsession. Now, it seems clear, that ancient desire has been fulfilled. The long lines at an amazing exhibit here in Tampa, entitled simply "Bodies," attest to the enduring interest of humans in their own anatomy and mortality. There are Bay City and mid-Michigan connections to this exhibit and a new worldwide phenomenon caused by similar displays. Dow Corning Corp. of Midland,Michigan, a former University of Michigan anatomy professor and a Bay City entrepreneur have combined to create the worlds most popular exhibits of the human anatomy. These exhibits have already seen by about 30 million people. The development and refinement of polymer preservation techniques in mid-Michigan not only have opened up the world to anatomical wonders never before seen, but also are reaching new dimensions in preservation of archaeological artifacts. Bodies . . . The Exhibition is drawing huge crowds to the Museum of Science and Industry in Tampa, but not without considerable controversy. Because the origin of some of the bodies used in the exhibition cannot be documented and may be unclaimed corpses from China, the Florida Anatomical Board tried to stop the exhibition in August, 2005. Many visitors to similar exhibitions say it has changed their views about the body, causing them to adopt healthier lifestyles. Because some of the dissections show the ravages of smoking on the lungs, shrunken and dark with tar, exhibition officials say they often find discarded packs of cigarettes on or around the displays. A Bay City firm, Corcoran Laboratories, Inc., that also has a Traverse City facility, holds sole rights to the Dow Corning technology and is one of three firms in the world selling the chemicals used in the preservation process. The other two firms are in Germany and China. The first exhibition of plastinated bodies and organs was organized by Dr. von Hagens in Mannheim, Germany. The anatomical road show of Dr. Glover and Mr. Corcoran began in 2000 at science museums throughout the U.S. Von Hagens Body Worlds drew 2.7 million visitors in Japan in three years, 1996-98, and more than 2 million in Korea in less than a year, 2002-2003. Polymer preservation keeps tissues from decomposing, allowing for the first time in history extended study and exhibition of bodies, inside and out. Water and fat are removed from the bodies and are replaced by curable polymers  silicon, epoxy and polyester. The body parts dry to firm, odorless specimens. The idea of displaying dissected human bodies has drawn outrage in societies since ancient times, notably accelerating in 18th Century Scotland when the legendary body snatchers Burke and Hare were afoot in the employ of medical schools desperate for cadavers to study. Dr. Roy Glover, professor emeritus of Anatomy and Cell Biology, of the U-M, is chief medical director and spokesman for the exhibition. An educator for over 30 years, he directed the universitys medical preservation laboratory. Dr. Glover defends against critics of the exhibition: Seeing promotes understanding and understanding promotes the most practical kind of body education possible, he said. Dr . Glovers main collaborator is Dan Corcoran, a Bay Cityan who about 10 years ago licensed a processcalled plastinization from Dow Corning. 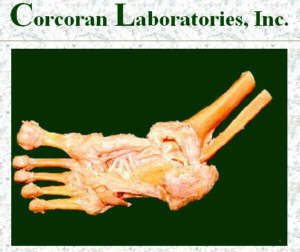 Mr. Corcoran operated his business from a building in the Johnson Street industrial park for about six years and several years ago moved the lab to Traverse City. Mr. Corcoran and Dr. Glover collaborate in staging exhibitions with Premier Exhibitions, Inc. (OTC: BB: PXHB) and Premier Limited in the United Kingdom. The British firm is a subsidiary of RMS Titanic, Inc. (OTC: BB: SOST). The firm has exclusive rights to salvage artifacts from the 1912 wreck of the Titanic, the tragic leviathan found in 1985 by Robert Ballard using the Bay City built research vessel Knorr from Woods Hole Oceanographic Institute, Massachusetts.Premiers Titanic, the Artifact Exhibition, has been visited by over 14 million people worldwide. Although a German scientist, Dr. Gunther von Hagens, of Heidelberg, claims patents on plastinization dating to 1978, Dow Corning was experimenting with the process in the 1960s and has developed and patented upgraded processes that are faster, easier and can be done at room temperature. The Dow Corning process was in use for wood preservation more than 35 years ago. The process for wood preservation was explained and artifacts depicted in an acclaimed documentary film, Ghosts of Cape Horn, produced and directed by James R. Donaldson III, of New York City. Dow Corning was among sponsors of the film that was premiered in Midland in 1970. Filmmaker, naturalist and environmentalist, Donaldson has family ties to Bay City. Other uses for the polymer preservation process include ancient documents, leather, guns, water logged rope, cork, glass, cloth, masonry, mummies, crops such as vegetables, textiles and other historical materials. Mr.Corcoran has worked with Texas A & M University that is preserving parts of a 17th Century ship, LaBelle, operated by the French explorer LaSalle and lost in Gulf of Mexico waters off Matagorda, Texas. Currently he is working with Dow Corningand Texas A & Ms Archaeological Preservation Research Laboratory (APRL) to preserve a 1,500 year old mud hut found in the Bering Strait in Alaska. "Body Worlds," was London's indisputably most popular exhibit, according to a British writer. The exhibit (www.bodyworlds.com) features 25 skinned corpses, in a variety of curious positions, along with organs, many diseased, all preserved with plastic. In a part of London where Jack the Ripper roamed, tourists by the busload have come tocontemplate corpses that have been turned into plastic and, some say, art. In von Hagens' process of "plastinization" used for the London exhibit, the flesh and fat of medical cadavers are dissolved in acetone, and the bones, nerves, muscles and organs completely saturated with plastic. The bodies are then modeled as if they were doing activities from everyday life, playing basketball, swimming, kicking a soccer ball. "But the show's clear tour de force is a plastinized man astride a plastinized horse," observes the London journalist. "The man holds his brains in his right hand and the horse's somewhat smaller organ of thought in his left." Von Hagens' stated mission in life is to bring anatomy to the people. Still, no one can dispute his show's success. Since the 1997 opening of "Body Worlds"in Germany, over 5,000 of the millions of attendees have reportedly volunteered to have their bodies plastinized after death. The answer to the inevitable question: Have people wanted to become plastinized after death? is yes. That may be the next frontier for the process, observers indicated.